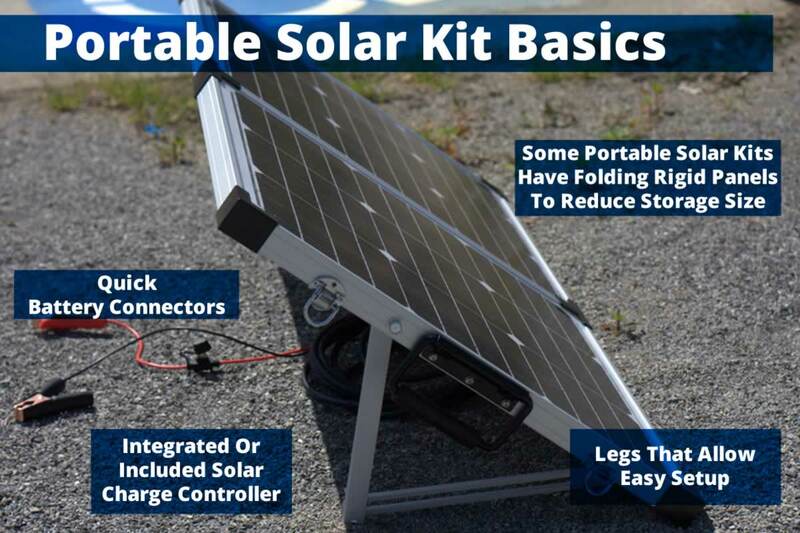 Learn about the benefits and advantages of having a portable solar kit to charge your batteries in remote and off-grid situations, Simply un-pack the solar panel and connect it to the battery that you want to charge. Position and direct the solar panel to have a clear view of the sun. Here are a few things you need to know about choosing a portable solar kit. Micro to Small - These portable solar kits are designed to charge small items like cell phones and small batteries. They often fold into very small packages that are not much larger than a regular envelope, although the footprint can be a few inches thick. The units often have a charging output of 1 Watt to 20 Watts. Medium To Large - The kits are used to charge anywhere from one battery to a battery bank. These portable solar kits have out put ranges from 40 watts all the way up to 160 watts. They often include Charge Controllers inline and have specialized connection kits. This article will mainly focus on this segment of panels. For years we sold rigid solar panels that people converted into their very own solar kits. Now many manufacturers have created truly portable solar charging kits. When purchasing medium to large portable solar kits you will find only a few sizes on the market. These kits are made in 40 Watts, 80 Watts, and 120 Watts. The main differences are the physical size of the panels, the price, and the output amperage from the panels. Your budget to purchase the panel. Below you will find a diagram referencing each part of a typical portable kit. Solar Charge Controller - this device allows the solar panels to charge the battery when it needs additional power. The charge controller will stop or significantly reduce the power to battery based on the current charge of your battery. These range from Shunt Type, PWM, and MPPT. The most common choice is the PWM - or Pulse Width Modulation. Rigid Solar Panels - Most portable units are being made with rigid solar panels to increase durability of the unit when in the field. Hinged Panels - The center of the panel is a hinge between two separate photo-voltaic panels. This allow for reduced size when stowing. Tilt and Place Legs - The legs are used to keep the panel in any configuration other than flat on the ground. The panels can be better angled to capture the maximum sun for your area. The legs often have a bolt for easy adjustment. Solar Cable - Most portable solar kits have a solar cable able to extend the reach of the panel by 15 to 30 feet. Battery Connectors - The battery connectors on most portable solar kits are designed for easy attachment and removal from your battery. This includes the use of alligator clamps and also Anderson connectors.